Upon this trackless waste of snow, cut by a shrewd wind, they sat down and wept. In China to Chitral H.W. ‘Bill’ Tilman completes one of his great post-war journeys. He travels from Central China, crossing Sinkiang, the Gobi and Takla Makan deserts, before escaping to a crumbling British Empire with a crossing of the Karakoram to the new nation of Pakistan. In 1951 there still persisted a legend that a vast mountain, higher than Everest, was to be found in the region, a good enough reason it seems for Tilman to traverse the land, ‘a land shut in on three sides by vast snow ranges whose glacial streams nourish the oases and upon whose slopes the yaks and camels graze side by side; where in their felt yurts the Kirghiz and Kazak live much as they did in the days of Genghis Khan, except now they no longer take a hand in the devastation of Europe’. 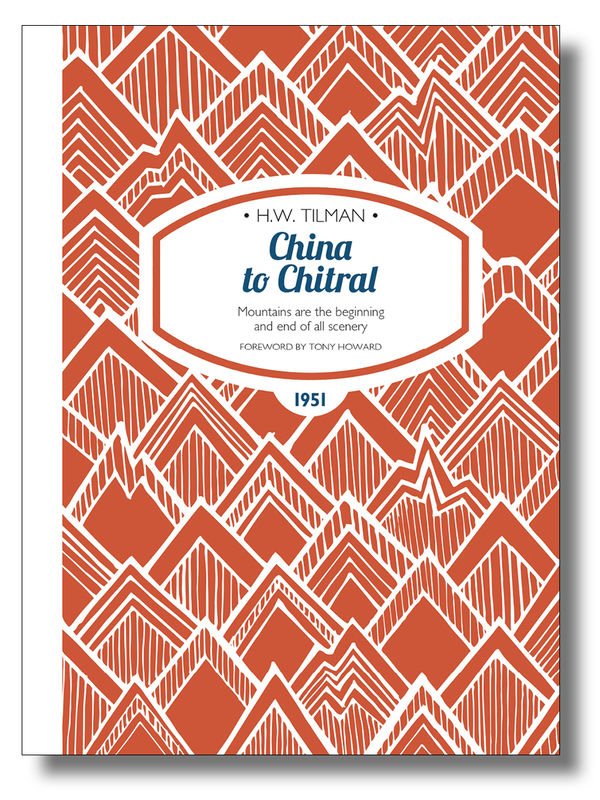 Widely regarded as some of Tilman’s finest travel writing, China to Chitral is full of understatement and laconic humour, with descriptions of disastrous attempts on unclimbed mountains with Shipton, including Bogdo Ola—an extension of the mighty Tien Shan mountains—and the Chakar Aghil group near Kashgar on the old silk road. His command of the Chinese language—five words, all referring to food—proves less than helpful in his quest to find a decent meal: ‘fortunately, in China there are no ridiculous hygienic regulations on the sale of food’. Tilman also has several unnerving encounters with less-than-friendly tribesmen. Tilman starts proper in Lanchow where he describes with some regret that he is less a traveller and more a passenger on this great traverse of the central basin and rim of mountain ranges at Asia’s heart. But Tilman is one of our greatest ever travel writers, and we become a passenger to his adventurers. track’ and rightly says, ‘By risking nothing, nothing can be gained’, adding, ‘On the whole I think that Romance in travel is inseparable from an element of risk’. His reference to Romance with a capital R refers here to the feeling of mystery, excitement, and remoteness from everyday life that being in uncharted areas brings, rather than its more common amorous connotation. Tony Howard is a climber with a long history of exploration from Arctic to Antarctic, particularly in North Africa, the Middle East and South Asia. He is an ex-instructor and guide and has contributed to outdoor magazines as a writer and photographer. Tony authored the mountain classic Troll Wall, about his first ascent of Europe's tallest rock face in 1965. He also founded Troll Equipment. ISBN 978-1-909461-34-5; 216 x 156mm, 184 pages, photos, maps. Softcover with sewn binding, cover flaps and matt lamination.